LIKE ALL IN ladies football circles across the length and breadth of the country, Aishling Sheridan is more than pleased to see the Irish contingent killing the game in Australia. Mayo duo Cora Staunton and Sarah Rowe, Donegal star Yvonne Bonner, Tipperary All-Ireland winner Aisling McCarthy and Clare native Ailish Considine have all well and truly caught the eye and made their mark on the Australian Football League Women’s (AFLW). With Round 5 underway this weekend, they’ve all seen action week in, week out, with this set of fixtures set to be no different. Cavan star Sheridan is watching on enthusiastically and likely keeping a close eye on the CrossCoders contingent, given the fact that she was part of that trial in Melbourne in September. One of 11 Irish players on the venture, it’s an experience she won’t forget any time soon. “I was there for 10 days getting a feel of the oval ball,” she tells The42 when Aussie Rules comes up in conversation. “It is a lot different to football. It’s probably a mix of football and rugby. “It was mental. We landed in Australia, we weren’t long off the plane and we went for a kicking session. The first three to four days were hectic. We went to the university in Melbourne, we were doing testing and all the combine tests. It was a tough day. For someone like Sheridan who had never played before, the fast-paced adjustment to the game was challenging. But like any sportsperson, she loves a challenge. And with every day, the pace just got faster. Next up was a game against a second-tier VFL side — top players coming up and hoping to get drafted into the AFLW — and the CrossCoders outfit, which featured camógs as well as ladies footballers, top-class rugby, netball and NFL players from England, Wales, France, Canada, the USA and Fiji, comfortably defeated what was in front of them. “We ended up hammering them,” she smiles. “We were all surprised. We had a lot of the Gaelic footballers playing together — myself, Aisling McCarthy, Yvonne Bonner, Muireann Atkinson. “We all know how to play football. We still had that kicking around the corner style of the game. Especially with the scoring, it was all very similar to football. Living the professional lifestyle for a short period, she saw a few things differ between here and there. Nothing major though, she stresses. Everything is on the up here but one must not forget that there are clear gaps between amateur and pro games. “There were certain differences,” the 22-year-old explains. “I suppose one of the girls got injured in the game and she had a scan the next day. That’s probably something that happens a lot in men’s football but not as such in ladies football. You might be waiting a week, but it was just the next day. With a league in full flow on these shores — AFL Ireland Women’s — Sheridan is more than eager to get involved and keep the game up. “You never know, I could be giving it another go at some stage,” she grins, adding that she’s chatting away to people about getting stuck in with a team here but football’s her priority. For now anyway. Her focus is on football, and leading the charge with Cavan. The Mullahoran forward, who graduated with a degree in Athletic Therapy and Training from DCU in November, is also fully immersed in life in the ‘big bad world’. Missing college football and the craic that goes with it, she’s working away and putting her degree to good use. She has her own Instagram page (as_athletic_therapy) where she sources clients; she treats teams, coaches circuits ,and does other bits and pieces in the fitness industry. Sheridan’s pretty happy with that because it all links back to her own football. Of course it’s all about 2019 now, but 2018 is one to remember, maybe not for the best reasons, for James Daly’s side. Painfully beaten at the death by Tipperary in the Division 2 league final, the Breffni faced the same opposition in a senior championship relegation dog fight. It was a pretty dramatic day, but keeping their senior status for this year was huge. “I think we were nine points down at half time,” she recalls. “We sat in the changing room and we took a good look at ourselves. We talked and we realised we weren’t performing the way that we should be. We came out at half time and we really changed up how we were playing. The hero that day will forever be remembered as Crosserlough teenager Lauren McVeety, who scored the all-important late goal. Expertly lobbed, it was an incredible finish and she also tagged on two points for good measure. While she’s still a minor, McVeety wasn’t in the senior set-up before the league kicked off but Sheridan was hoping that they’ll have a few of the younger guns in sooner or later to freshen things up — particularly with some of the core, more experienced group taking a step back. “Our main players: your Aisling Doonan [Maguire] and your Bronagh Sheridan aren’t there this year which is a massive loss for us, especially in the forward line,” she concedes. After a mixed bag in Division 2 so far this year — an opening round draw with 2018 All-Ireland intermediate champions Tyrone, a hammering at the hands of Ulster rivals Armagh and a hard-fought win against Clare last time out — Cavan will be hoping to steady the ship against Waterford on Sunday (throw-in 2pm, Maghera, Virginia). With work to do to seal a top-four finish, Sheridan’s side will be confident they can up their game with Daly at the helm once again. Continuity is key after all. All is good, but Cavan are hoping all will get better over the next few weeks. Email “Football first for Cavan star Sheridan but lure of AFLW life Down Under remains ”. 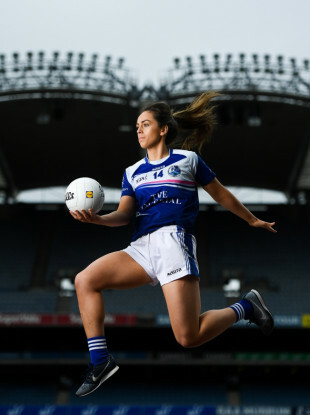 Feedback on “Football first for Cavan star Sheridan but lure of AFLW life Down Under remains ”.